Behold the FROST! Winter Fantasy! Behold the beauty of winter! Winter Fantasy Mercenary Skins! Did the cold ever bother you? Not these ladies! In celebration with the Winter Olympics, new Winter Fantasy skins are available for our beauties: Tania and Pocahontas! These mercenary skins give our lovely mercenaries a FROSTY FASHION sense and just like other skins, you can enchant it to enhance their stats! But these special skins can be enchanted twice! That's right, TWO ENCHANTMENTS! What are you waiting for? These exclusive skins will only be available on a limited time! 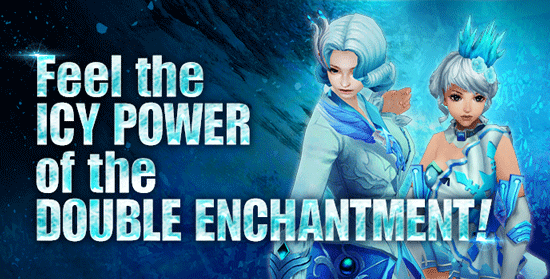 So let it go, don't hold back and get the Winter Fantasy skins now!